In front of thousands of employees and media in Dallas, Texas this morning, Southwest Airlines showed off its new corporate image, comprised of Bold Blue, Warm Red, Sunrise Yellow, and Summit Silver. In addition to the new aircraft livery, which was leaked this weekend, a new heart logo was also shown. Before the hangar doors were rolled open, CEO Gary Kelly said "2014 is a very big year for Southwest Airlines, and today is the exclamation point." The airline is in the midst of a metamorphosis, as it continues to absorb what's left of AirTran. All of AirTran's 737s will be repainted by the end of this year, and the 717s that belonged to AirTran will join the Delta Air Lines fleet. Southwest said it will take seven years to re-paint all of its fleet. They have 122 older model 737-300s in the fleet, and they're being phased out, so I'm guessing none of those will see the new paint. Time-lapse video of the painting of "Heart One"
Along with the plane, a new corporate heart logo was introduced. Southwest has used hearts and the "LUV" theme since its early days in the 1970s. They once sold plane tickets from automated kiosks called "love machines" and called onboard cocktails "love potions." Next month, Southwest will be free from the shackles of the Wright Amendment. The amendment restricted Southwest's nonstop flights from Dallas to states that border Texas, and a few other exceptions. If you wanted to fly from Dallas to Chicago, for example, you had to stop somewhere like Oklahoma City first. This will allow the airline to fly longer, nonstop flights from that hub. Gary Kelly said that Southwest's heart is "stronger than ever" but its labor unions might not agree. 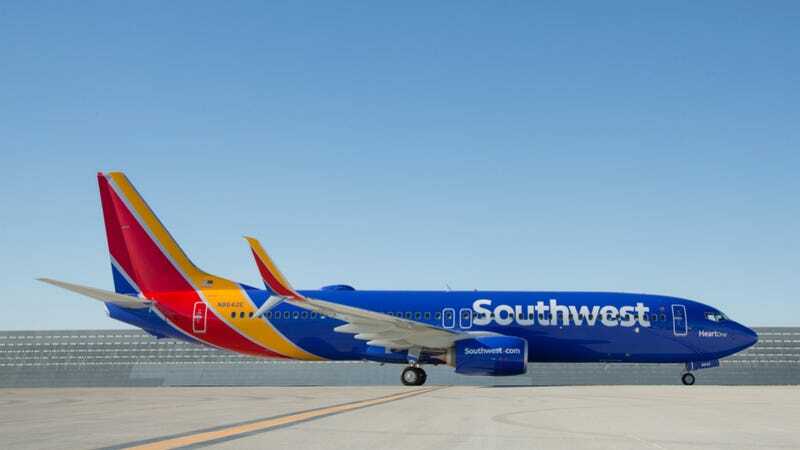 The airline is roughly 80 percent unionized, and is currently undergoing contract negotiations with several of those unions — in particular the Transportation Workers Union, which represents Southwest's ground operations employees. The TWU and the airline have been at the bargaining table for over three years and are on the brink of seeking federal mediation. Southwest is also struggling to maintain its status as the top U.S. airline for on time performance and baggage handling. In recent months, the airline has lagged near the bottom of the class in both categories. In July, Southwest began flying the first international flights in its history, by taking over routes formerly served by AirTran. But they have made no secret of higher ambitions to expand to Hawaii, Alaska, and internationally. A new reservation system has given the airline the capability for international reservations, opening the doors to Canada, Latin America and South America. Reception of the new livery online has been mixed, and I've even heard from people who were in Dallas this morning who told me, "It looks better in person" or "it's growing on me." Let's check out some of the responses from Twitter. Southwest said they plan to have 60 planes re-painted before the end of the year. Currently, the airline is not re-doing its aircraft interiors. After all, they were just revamped in 2012. But they did say an update is not out of the realm of possibility, and that are exploring options in order to do so. Now that you've seen more, what do you think? Southwest will air brand new commercials tonight during Monday Night Football, with the tagline, "Without a heart, it's just a machine." Not bad.